If I told you I've been working on this page since April, would you believe me? It's true. Really. I tried this photo with so many different collections but it just never came together. It wasn't until I ordered a few pieces from Echo Park's Here and Now collection that it finally clicked (and boy am I relieved to have it done). There's a yearly event here called Community Arts Day. Part of it is an art show displaying work done by students in our school district. This is a pop art piece Alexa did following the styles of both Andy Warhol and Wayne Thiebaud. Even if I don't end up keeping the original (although I think I'd like to have it framed), I'm happy to have it recorded in her scrapbook. I added the white text in Photoshop so the photo would resemble an art poster. You can check out Echo Park's Here & Now collection in the Paper Issues store. Use the code HELLO for 20% off your order, plus shipping is free on orders over $60. Fabulous layout! Love how you used the EP with these photos!!! Perfect combination!!! 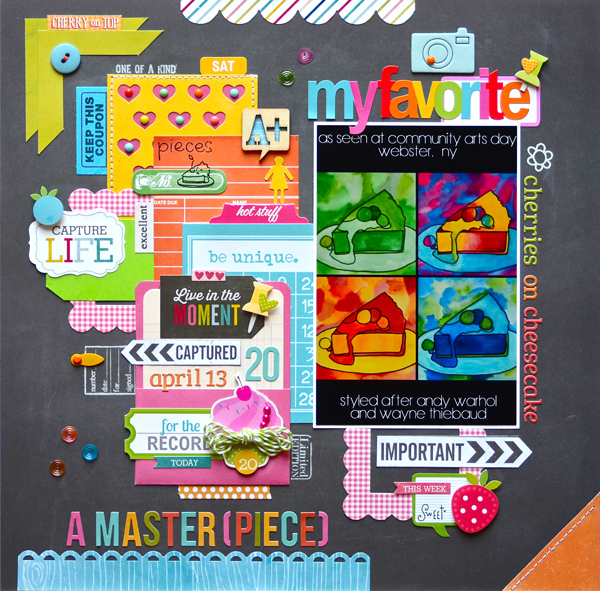 super cute, i am constantly amazed at how you can work so many embellishments onto your layouts! what a super cool layout- i could stare at it for an hour just looking at all the embellies!! And her artwork is fantastic! WOW! What a color packed page that totally works (you are daring) - love her art and you showcased it wonderfully! OMG! This is total eye candy!..love all of it! Alexa's piece is gorgeous and I love how bright and bold this layout is, complements the artwork perfectly! I always get a little jolt of homesickness when I see you scrap places near my hometown (Penfield)! Wonderful layout! Oh wow! So many things to admire! I'm loving those colors!! Perfect! I love the bright colors you used to enhance your daughter's piece. Beautiful page! The papers you ended up using are PERFECT! Definitely frame the original piece!!! This is so darn fun!!!! I love all the color and you could just sit here forever and be mesmerized by all the little bits used on the layout! You are so darn good at that! Fantastic job! This is a fave! Worth the time and effort! The photo is awesome! That is an awesome poster and deserved special treatment! Perfect product choices, as always. I love her art piece. She did a fantastic job! Great collection to showcase it. I love your title. so colorful, perfect for the photo!!! Looks great Lisa!!! WOW Lisa. Just beautiful. I am always in awe of how wonderfully you put everything together. LOVE the artwork, too fun. Wow, I'm always amazed at what you can fit on a page and it still looks amazing and perfect! This is awesome Lisa! I never would have guessed you struggled with it. It looks really good. I love all the bright colors. EEEEEEEEEEEKKKKKKKKKKKKKKKK!! Wanna know what I am HAPPIEST about on this LO???? I see the words WEBSTER, NY on that photo!!!!!!! YAY!!!!! Anyhoo... I am being a hometown geek :) I love love love love your lo!! LOVING the colors and love love love all the goodies on here!! Sooooooooo gorgeous!! Well, it was definitely worth the wait, Lisa!! The EP is perfect with that photo and I love the Andy Warhol effect!! Such an amazing page! I must say this is the most beautiful layout I've seen all morning, perhaps all summer! What a lovely page! Thank you so very much for sharing! Great work! oh I love all the treasures and bits on this!!! I just LOVE how this turned out! You pulled it together perfectly. It's a wonderful PIEce of art!